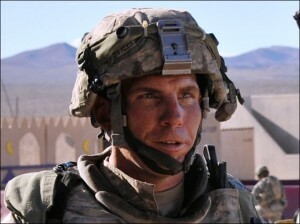 Robert Bales in August, 2011. As I listened, I realized that I have no close friends who are recent veterans. I know people in Iraq Veterans Against the War, and I like them, but they are not close friends; we show up at the same meetings and events rather than hang out together on weekends. My friends have traveled to Iraq and Afghanistan with Voices for Creative Nonviolence, Christian Peacemaker Teams and other groups. Unlike many Americans, I know the names of some Afghan and Iraqi civilians. But I have only second-hand relationships with people currently or recently in the military — a guy I went to high school with who is my friend on Facebook is in the Army, my sister-in-law’s friend’s ex-husband was in the Navy, my husband’s cousin whom I have never met was in the Army. That kind of thing. But how can I be compassionate and constructive when I know so little about what the lives of men and women in uniform are like? How can I be nonviolent? In this militarylessness, I am not alone. In fact, I am the majority. (Finally, I’m in some majority in this world!) According to a recent survey from the Pew Research Center, just one half of one percent of American adults has served in active duty at any given time — 15 million of the 240 million Americans over the age of 18. That is startling. What is also startling is that if you are in the military, it is likely that your parents, aunts and uncles, siblings and cousins are also in the military, and so are your friends. Admiral Mike Mullen told Time magazine, “We come from fewer and fewer places — we’ve BRAC-ed our way out of significant portions of the country.” The retiring chairman of the Joint Chiefs of Staff was referring to the Defense Base Closure and Realignment Commission process that has shuttered hundreds of military posts across wide swaths of the nation, meaning that most members of the military come from and return home to fewer but concentrated areas. There is a disconnect between the civilian and military spheres. Why is this important? Because into that disconnect steps judgment, condemnation, assumption and ambivalence. And now is not the time for any of those sentiments. Troops from Iraq are returning to the United States — haunted, disabled, addicted, proud, grown-up, transformed. But troops in Afghanistan are facing a new phase of that protracted battle in the wake of Army Staff Sergeant Robert Bales’ massacre of 17 civilians in Kandahar on March 11. We still don’t know the whole story. In fact, the number just changed from 16 to 17 dead, with no explanation given by military investigators. Now it is nine children and eight adults who were killed. Six of the children were part of one family, including four sisters — Masooma (9), Farida (6), Nabiya (4) and Palwasha (2) — and their brothers — Faizullah (12) and Ismatullah (13). Their mother, Bibi Zohra, and grandmother, Shah Tarina, were also killed. Mohamed Wazir — father of the six children, husband and son to the two women — mourns them all. He told The Wall Street Journal that he is haunted by guilt, “It hurts me a lot when I remember occasions when I shouted at my sons because I asked them to do something and they ignored it… I feel so very sorry now.” His brother Akhtar Mohammed (20), his brother’s new bride, Bibi Nazia (18), and a nephew, Essa Mohammed (15), were also among the dead. Will we ever know what went through Robert Bales’ mind as he shot and killed nine children and set bodies on fire? Will we ever know if he was alone or if he acted with others? My family including my and Bob’s extended families are all profoundly sad. We extend our condolences to all the people of the Panjawai District, our hearts go out to all of them, especially to the parents, brothers, sisters and grandparents of the children who perished. I have no indication that my family’s own safety is at risk, but I appreciate the efforts that have been undertaken to protect us. I hope there will soon be no reason for protection of families, whether here or in Kandahar Province, or anywhere, because the pain inevitably inflicted in war should never be an excuse to inflict yet more pain. The cycle must be broken. We must find peace. I know the media has a right to pursue and report news. As you do your jobs, I plead with you to respect the trauma that I and my extended family are experiencing. Please allow us some peace and time as we try to make sense of something that makes no sense at all. That is a heavy thing to say. Anyone in the military could have snapped, could have killed nine children and almost as many unarmed, pajama-ed adults. What this nation — what this war machine — demands of men like Robert Bales and women like Karilyn Bales is too much, it is wrong, it is criminal, it must end. Acknowledging that, and working for the end of the wars, will not return Mohammed Wazir’s family to his open arms. But it does begin to bridge the divide. Would be of interest, medically & organizationally, if U.S. Atomic Veterans (usually as to Nevada, Japan, Pacific) have started any kind of dialogue with trash-depleted uranium -related veterans (Kosovo-Serbia, Iraq-Afghanistan …)? I had read about the innocent victims and learned of their names but this is the first time I read the statement issued by Karilyn Bales, the wife of the accused. It adds a certain balance to the whole story as well as additional weight to a burden that should fall heavy on us all. It’s hard to find anything that makes sense in something so senseless but maybe taking on the burden of “working to bridge the divide” is the only thing that really makes sense after all. Frida Berrigan has hit upon the maor issues, the ones that I have been chewing over since this incomprehensible story broke. What worries me is that a show trial and possible death penalty may close the issue, by making this an isolated incident of a rogue soldier. Clearly it is not. The military and the rest of us, for whom the war is a news item more than a reality, must weigh the destruction of the minds and souls of the soldiers who return “healthy,” before we go bounding into the next decade of a war that depletes human capital in ways we refuse to face. Thanks to Frida Berrigan for pointing out the unspoken issues.